I woke up feeling great, and managed a good nights sleep. I learnt a few years ago when I started running marathons that it’s the night before the night before (in this case Thursday night) that is the most important for a good nights sleep. I try to focus on the 2 nights prior, so that if I don’t have a good sleep the night before, I don’t get stressed out – stress causes even more adrenaline and cortisol to be released, making it almost impossible to sleep. A few days before the race I sat down and worked out my nutrition plan. It is so important to allocate some time to this, think of all the hours you have trained, you want to make sure you get your nutrition right. Minimum of 30 grams carbs per hour and around 4 grams protein per hour. Target of 15 hours = 450 grams carb, 60 grams protein minimum. My aim was to consume more than the 30grams per hour minimum in the first half of the race, as it becomes harder and harder to consume calories the more exhausted your body is. Building the “base fire” with carbohydrates and protein is an extremely important consideration for an endurance event, as this is what will keep burning all day long. I have learnt from practice that I can take in up to 50grams (or 200 calories) per hour for the first few hours. My main source of fuel during the first half of the race was a liquid fuel called Perpetuem (made by Hammer), along with Hammer Energy bars and Banana. It’s good to have some solid foods in the first few hours if you can tolerate it, as it becomes harder to digest foods as the race goes on so you will need to have liquid fuels. My breakfast was 200g tub of natural yoghurt with a banana and one scoop of Hammer HEED (carbohydrate and electrolyte drink mixed with 250mls water) this is the breakfast I have everyday before a long run, so I know it sits well, and provides me with a good base of protein and carbohydrate for a long run. Standing on the start line of the North Face 100km race was one of the most exhilarating and scariest days of my life. I was so happy to be there, having only made the decision to continue with the journey 8 weeks earlier. I had broken my wrist in late January, (2 weeks in a cast, followed then by surgery meant I’d had 5 weeks off proper training). I decided the 2nd week of March I was still going to give it a go. I knew that I was a little “undercooked” for the event, I’d only managed to build my training up to a maximum of 50kms, I revised my goal time from 14-15 hours (prior to my accident) to 15-16 hours – I had done all I could to get me to the start line, and I felt strong, relaxed and ready. I started the race in Group 2, it was fast paced and pumping. I enjoyed chatting with the other runners during that first 5kms on the road. As we descended the stairs into the valley I had that awesome feeling when you just love the run. I haven’t experienced this first half of the North Face course before; I enjoyed the scenery and anticipation of what was around the corner. I ran straight through CP 1 and began the journey out along the Narrow Neck Ridge. It seemed most people were up for a chat during this part of the race – it is nice to learn about other people’s journeys and occasionally sneaking a look sideways into the valley. It was gorgeous. I was excited to experience the Tarros Ladders – it wasn’t as scary as I’d thought! Fortunately there wasn’t much of a queue when I got there, only about 4-5 runners. A quick stop at CP 2 to refill my water bladder, get two more energy bars from my pack and refill my perpetuem bottle. The next section of the course down into the Megalong valley was my favourite – lots of variety, beautiful scenery, and the didgeridoo player was very cool! I was struggling a bit on slippery the down hill sections, lacking some confidence – as I didn’t want to fall and hurt my wrist. CP 3 was a quick stop to refill my perpetuem bottle, stock up on 2 more bars, eat a banana and grab a flask of gel. Running past the 50km mark was such a buzz – I just achieved a new personal record, I’ve never run more than 50km before. I shouted out a Whooo Hooo ! I checked my watch, 6 ½ hours to the half way point, right on track for my race plan of around 15 hours. I knew the second part of the course would take longer, allowing for fatigue and it’s tough – I’ve done the North Face 50 the past two years. The climb up Nellies Glen was long, but I enjoy climbing, and was powered by the thought that I would see my family at the next Checkpoint. I arrived at CP4 at 1.50pm it was a quick 10 minutes to reload fuel – (more perpetuem, top up the gel flask), eat a banana, empty the rocks out of my shoes. Then I was off again, my legs starting to really feel fatigued. I stopped briefly at the top of Gordon Falls to refill my water bladder, and pee. As I came out of the climb and onto the road past the Fairmont I was struggling a bit with self doubt and motivation, “why am I doing this “ , “am I capable of making it “ … I chatted with other runners, a great way to stay distracted from the pain and stay motivated to keep running. I enjoyed stretching my legs out for a run along the road up to CP 5, and stepped up the pace as I became emotional about seeing my family. I was trying hard to hold back the tears, but there was something very special about knowing they were there to cheer me on. I have not experienced the joy of having support crew before. I came into CP 5 around 5.45pm, still on track with my race plan. I had a 15 minute pit stop, Greg worked hard on making sure I had all the fuel I needed on board, gave me my fleece and spare batteries, and encouraged me to try to eat a little solid food – I managed to get a banana in, and with the few mouth full’s of 2 minute noodles I calculated it was around 35 grams of carbs, another hours worth of fuel. I needed a change of flavour so switched my drink bottle to Endura for this last section of the course. I left CP5 right on 6pm, feeling warmer but weary. I was struggling to get my legs warmed up again. About 1 km in, I realized I needed to pee, so head torch off for a quick bush wee! I then started to get back into it, found someone to chat with for a bit, but by this time, not many people are in the chatting mood. As I descended down Kedumba my knees were screaming, I tried to think positive happy thoughts – “I’m lucky to be here” , “its not that bad “ , and thinking about the people you hear of running for hundreds and hundreds of kilometers raising money for charity – this was only 100km, “get over yourself” … I kept on saying. My pace was now down to a shuffle. Head torches kept on coming up behind me, then passing by, generally with a hello and some words of encouragement as they passed by me. I was hurting. I couldn’t wait to reach the bottom of the valley and start the climb – my knees desperately needed a break. Finally, I started the climb, and was feeling better, my pace improved, and I managed to catch up to some of the runners who had sailed past me on the downhill. “You’ve got this “, I keep repeating to myself. “Finish, and you never have to do it again.” I keep repeating these to things, over and over and over. Mid way through the climb I started to notice my breathing was laboured… hmm, not sure what was going on. The cold air seemed to be affecting my lungs, and I just couldn’t get enough air in or out. I could hear the wheezing as I tried to breath – I was trying hard not to panic or let it get to me. “Finish, and you never have to do it again” …. I sipped Endura every 10 minutes, kept up the electrolyte tablets and gel. Solid fuel was not an option during this last 4 hours. I stopped at the First Aid Station at 91km, and asked for some advice – they were very helpful and suggested to use my fleece like a big scarf – they helped me wrap it around my neck, to try and reduce the impact of the cold air on my lungs. I felt a bit better as I climbed up that last section, the motivation that I was going to finish out weighed the fear that the wheezing was getting worse and I was struggling to breath. I checked the time, I think it was about 8.30pm … I knew how hard this last 9 kms was, and I wasn’t feeling great, I was still hopeful I would get within my goal time – but knew it would be closer to 16 hours than 15. My lack of long distance training was obvious. As I moved through the last 6 -7 km section of single track, a few more runners passed by me, I realised I was shuffling not running! I tried to pick up the pace, and then kicked my toe on a tree root, stumbled and nearly fell … I decided it was better to finish in one piece, so went back to my shuffle. I was concentrating so hard on breathing and not tripping over that the time actually went quickly. I then became desperate to reach those Furber Steps …. “Come on, they must be here soon” The final climb up the stairs took me 20mins, it was exhausting – as I came around the corner I heard Greg call out “ here’s Tam, here she is “ my kids ran out and held my hands to run with me, I burst into tears, my lungs and legs collapsed as I crossed the finish line after running for 15 hours and 43 minutes. 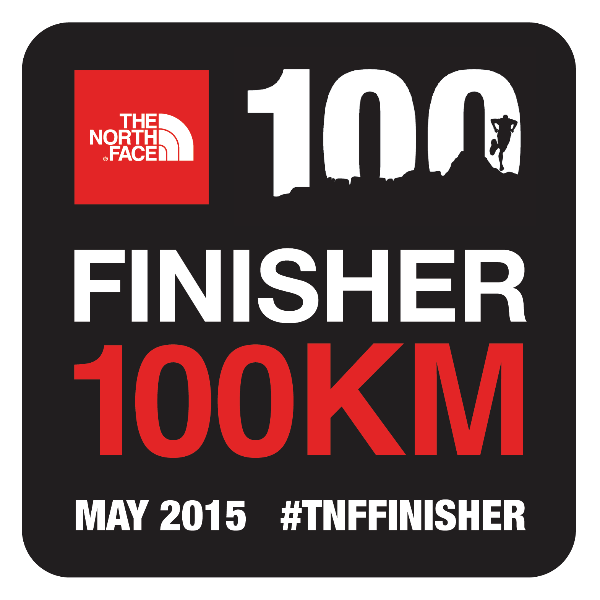 Running the North Face 100kms is the hardest thing I’ve ever done, and will probably ever do! Fighting through the negative thoughts, the pain, the self doubt – and coming across the finish line is what makes it all worth while. Gear: My hip flexors and knees have always given me a lot of grief on distances beyond 15km but since I’ve been running in Hoka’s (I use the Hoka Challenger ATR from Pace Athletic) my hip flexor issues have been massively reduced. I know also that heading down Kedumba at about the 80KM mark my knees were is much better shape because of the cushioning the Hoka’s provide. I’m not sure what the science is and why the thicker soles and lift make such a difference but it works! I wish I’d changed head torch batteries at CP5 as they started running low in the later stages and bright light is crucial along Federal Pass before Furber steps. I also carried a tiny but very bright LED bike headlight in my hand and that was great to pick through rocks and roots in the last few KMs. Highly recommend changing into dry shirt and thermal layer (top) at CP4 and also it was great to change socks at CP5 as mine were full of sand and stones. Pre-Race Training: My running has improved massively over the past 2 years from the strength and conditioning work put in at Joe’s Basecamp. I hadn’t done the training distance that most trail run programs dictate for a 100km effort but I believe the non-run work we put in at the gym gave me benefits way beyond cranking out the miles in training. The technical trails, climbs and descents give every bit of the body an absolute thrashing and the functional training that Joe provides gives you the leg and core strength to deal with it and push through. The final climb at the 99KM mark up Furber Stairs I attacked like a conditioning session, knowing it would be super hard but a welcome site at the finish. The Course: It’s a beautiful course and I was really glad to have run most of the course before. The bits I hadn’t run gave me some big shocks e.g. the short steep climb up to Ironpot Ridge from Dunphys. I’d never visited Nellie’s Glen before, it’s a brutal climb somewhere around the 50km mark and had people laid out everywhere having a breather. Try and run all of the course beforehand especially Kedumba and out of the Jamieson Valley and along under the 3 sisters because those last few hours at night are torturous and seem to go on forever. I was in Wave 6 so even heading out at front of this wave meant basically walking down Furber steps and also through the Landslide and along to Golden Stairs. This slow pace may well have saved me later in the race but was a little frustrating at the time. Nutrition: Big thanks for Joe and Tamara for the nutrition plan foundations, I’m normally laissez-faire on these types of plans but for once gave it a lot of planning attention (spreadsheet geeky) around carbs / calories and protein needed per hour for my body size. I forced myself to eat every 15 minutes as advised and it seemed to work well. For the first half of the race I mixed up Clif Bars, Tailwind, and also zip lock bags of mashed Kumera with butter and extra salt in it – hat tip to Gordy Kirkbank Ellis. It worked well. The last 6 hours of the race I could barely stomach anything except small amounts of water, even Tailwind, without my stomach wanting to push it back up. I had no appetite for gel sachets at any point, I had planned on the Espresso Hammer Gel in the last few hours but there was no way my body would have stomached it. The food at the early check-points was great and I nailed the salty chips eagerly and even a couple of choc muffins. However one thing I wouldn’t do again was at CP3 (six foot track) I had a beautiful cup of tea with 3 sugars (why not eh?) felt brilliant for the next 45 minutes then 10% of the way up Nellie’s I think I had a massive sugar crash, felt like vomiting for the next 20 minutes and generally felt crap. I think it was the sugar in the tea spiking then crashing and Nellie’s Glen is a terrible place to have that happen! It is simply fantastic to have a support crew (thanks Tam, Andrea, Bec, Gareth & Nikki). To get to a later checkpoint and have all your gear ready and waiting, for them to refill water bladders, cheer you on and most importantly to help people who are struggling is gold. Coming over the finish line to a big cheer is fantastic. It was very comforting to know that Nikki was in safe hands at CP4 when she got into trouble. Although I believe I did ‘enough’ training, I had not done anywhere near as much as what the training schedules provided by 3-4 different sources suggested. I was time poor so focused on the quality approach.. so worked really hard to ensure that each session I put in 100% with the time available. Having had the one day up there 2 months previously and to know what was coming in the last 30km was extremely useful despite the pain i knew was coming, it was pain I had gone through before. Pretty well had all bases covered there. Was in two minds whether to run with full length Skins the whole race but the Nike ones I had were very light.. and so chose to go with that. I have learnt that I don’t think my toes are suited to Injinji toe socks, but this will be a personal thing for most. I have used them for a while but put a pair of normal socks in my first CP bag and changed into those and that helped relieve the pressure I was feeling on my small toes. The lesson here is trial all your gear (Although I did that.. I wasn’t sure whether it was just the amount of training I had done that hurt my toes.. or the socks themselves). Poles/sticks. It was only on the downhill of Kedumba that I thought I would look for some sticks to act as poles for the climbs up. I had never used them previously and never considered them. There was enough loose branches around and I was lucky enough to find 2 that were almost a perfect size. I was advised 200-250 calories per hour so prepared 3-400 in each bag so I had a choice to choose from. My food was a combination of Tailwind, Hammer almond bars, (10g of protein in each) and 2 corn cakes with almond and coconut butter.. plus a small pack of plain salted chips. 2. Refill Bottles with tailwind. I had thought about prefilling some containers for each checkpoint bag, but thought it may have been too heavy to carry all the bags to the registration. But I know it would have been only 1.5l water so approx 1.5kg Definitely something I would do differently. In the first 30 minutes we passed the guy who unfortunately broke his leg. This was a subtle reminder to keep focussed throughout the race. The poor guy’s race was finished. All that training, all the preparation. Gone in a second. For the first 46 km, I needed to carry enough fuel/nutrition to get me through about 7-8 hours. I had 400g carbs in my tailwind. 400 g of hammer bars, and 4 corncakes with the same. I then banked on some additional fruit/food at the first two checkpoints.. as well as using the supplied Endura at these points. I also put 8 Hammer Endurolytes in each CP bag as well.. and was having about 2 an hour to hopefully (succeeded) avoid cramping like I did at Jabulani 42km a month ago. I was fortunate to run the last half of the race mostly with Henry, but during the first half of the race I had a couple of other runners who I met on the course, and we seemed to pass each other a couple of times and have a chat. Company, be it friends or strangers definitely helped kill the time a bit.. swapping stories.. probably telling the same people the same story you told them an hour ago. Pain Points – Probably Nellies got me. Unexpected and at around the halfway mark. 400m of elevation in 1.5km distance. Or about 8% of the course elevation in 1.5% of the distance. Probably caused the pain later in the race with my quads. Once the quads get sore you start to compensate them and tend to work parts of your legs you normally wouldnt and I think that’s why other little niggles also started to appear. Knee, and ankles. To be honest though the calfs stood the test which surprised me. Loved the crowd support too – however it took me a little while to realise they knew my name because it was on my race bib. What could i do better next time ? It’s a huge commitment to train for an event like this. But if its at all possible, I would try and train more on the course itself. I had one session only, and I think if I had maybe had 3 sessions in the leadup.. and split the days into 30-35km it would have helped and Im sure Nellies Glen elevation would have been in one of those session. More stairs and more hills, both up and down. I know now why Matty Abel had us running down Snake Hill. Kedumba is probably more like Beacon Hill road or Roseville Bridge (except 4 times as long) , but the traffic and truck fumes etc..doesn’t really make those hills a nice training ground but still food for thought. Race pace – Everyone said go slow at the start. I found myself over the first 3-4 hours running at 16 hour pace. My goal was sub 20-24. But I felt good in the first 3-4 hours but then slowed after that. I don’t think I went out too hard for the level of fitness I had, as I was slower than my Jabulani race pace. But the times don’t lie, and the hurt across the finish line suggest I probably went out too hard. So if, and I really stress the IF, there was another attempt I would have to train that little bit harder so I could hold the pace I started with.. or at least finish the last 22km in sub 4 hours. Getting in at 1.38am meant no real celebration, but to have the JBC crew there was just awesome.. can’t say how important that was to see familiar faces. I would have probably just got in the car and go home.. but to sit at the table and have a chat for 15-20 minutes with everyone was fantastic. Pre race felt mentally prepared, excited, nervous and fit enough. Definitely not enough distance training but I thought if my mental state was good it would get me through physically = Mistake 1. Nutrition on track until 30km mark where I started feeling nauseous and dry reaching so I couldn’t stomach food from 30-57kms but I should have forced it in = Mistake 2. Mouthpiece on bladder had a split in it and was leaking so thought I was drinking a lot (mentally started worrying about over hydrating so slowed down on the fluids) but was not consuming enough so started dehydrating= Mistake 3. Came good again until I got to Nellie’s Glen then had a good vomit there so that combined with no nutrition and not enough fluids probably got me. I was so lucky to have Tam, Andrea and Gareth as support crew as they really took such good care of me and it’s such a comforting feeling when your not well to have your mates take over and look after you. I got very emotional in the car on the way to the medical centre. I had a big cry, I’ve never not finished something. I know in the grand scheme of things it’s just a run but in reflection what it was for me was a huge challenge that I did train for, get excited about and I really wanted to finish it with my partner Henry. So my biggest lesson, my mental strength actually isn’t always going to get me through. You have to do the training, check your gear and realise that some days are just not yours.